This week in my Dance & Discover classes, I’ve been giving my young students some challenges. We’ve been in class for a few weeks, and they’ve gotten used to some of our routines and what is expected of them and what to expect from us. We’ve built up some imagination muscles, some motor skills, some terminology memory, some songs, warmup routines, tap and ballet skills, and tumbling skills. Next on my list as a teacher for ages 2-18 is building resilience. A few years ago, an article published in Psychology Today spread rapidly and detailed how new college students were showing an unprecedented amount of anxiety, panic attacks, and difficulty dealing with independent life and the pressure of college. College counselors were finding themselves helping 19-year-olds create coping mechanisms after receiving a “B” grade on an exam or having a conflict with their roommate. After reading this article a few years ago, I became determined to include building resilience and independent problem solving into the lesson plans for my dance classes. Children who build resilience accept a failed attempt as just a failed attempt – not a sign that they are a failure. Children who build resilience learn from mistakes, pick themselves up, and try again. Children who build resilience can empathize with someone struggling and help them through it because they have experienced the same feelings and recovered. Children who build resilience find solutions to their problems rather than choose to find something or someone else to blame. I strongly believe that children with resilience will become the leaders that our world needs. 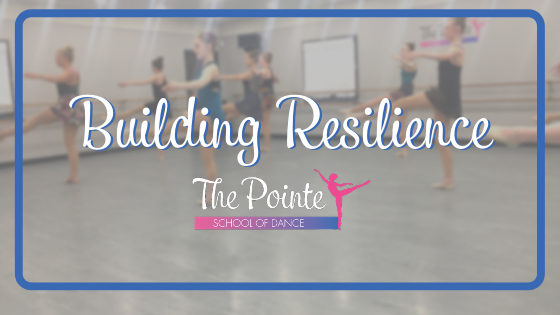 How can a child build resilience in a dance class? Challenging students regularly in class! This week, in my Dance & Discover 3 class for kindergarteners, we built “mountains” out of play traffic cones to leap over. I set up one small “mountain” only one cone high, one medium “mountain” two cones high, and one tall “mountain” three cones high. This was probably about 2 feet tall – quite a challenge for a 5-year-old to jump over! I did not expect that everyone in the class would successfully leap over all three obstacles that day. I hoped to build some resilience by helping them accomplish the first two tasks and struggling with the third. This is exactly what happened! We talked about the task before-hand, I let them know that the final “mountain” was a real challenge and that as long as they gave their best effort, I would be happy with them no matter the result. I was so impressed with the way my young students accepted the challenge, gave their best, and became OK with themselves regardless of the outcome of that last leap. Maintaining clear expectations and boundaries. I think every teacher has repeated “We get what we get and we don’t throw a fit” – and for some young students, dance class may be their first experience with their peers outside of the home. We assign spots that are various colors, dance with stuffed animals in every variety, and scarves of every color. Even if a dancer is determined that dancing with the puppy they wanted instead of the pig they got is so important, we use this moment to teach perspective: that we are so lucky to be in a fun dance class and that a little thing like dancing with a different animal or being on a different colored spot is not a reason to be upset. After class, they’ll be glad that they just kept dancing instead of missing out on the fun to pout. Dancers learn that the spot they are given is the spot they dance on and that it’s OK. They learn to accept a small disappointment and move on! Holding students accountable. We know that our middle school and high school dancers are busy students with homework, other activities, and a social life – but we keep them accountable for their own progress in class. It’s easy for anyone to respond to a challenge with a complaint, but it’s not easy to admit “I’m struggling on this section because I zoned out when it was taught.” Our instructors coach dancers through moments like this – showing them that it’s okay to make a mistake, and to “own it if you’ve blown it”, and then to find a solution. We ask dancers to repeat a combination across the floor if we know that wasn’t their best effort, to think about the combination they weren’t fully engaged in learning and then ask smart detailed questions to get caught up. We are kind always, and firmly hold on to our high expectations for our students in every class and every rehearsal. The benefits of learning the skill of being resilient from a young age are clear and crucial later in life! Children with resilience can separate their self-image and self-worth from one disappointment or failure. They know that struggling with one school assignment doesn’t mean they’re unintelligent, that struggling with a dance skill doesn’t mean they’re a bad dancer, and that they can find a solution to any situation. Students with resilience face challenges head on and look for creative ways to problem-solve instead of exclusively focusing on the problem. Another word for resilience is “grit”. I’m a big believer that successful people become successful because they have the grit to work through situations and the grace to work with other people. At The Pointe, we try to model and teach both grit and grace to our students in every lesson.